We sat down recently to rewrite the core Xbox Xponential lesson. 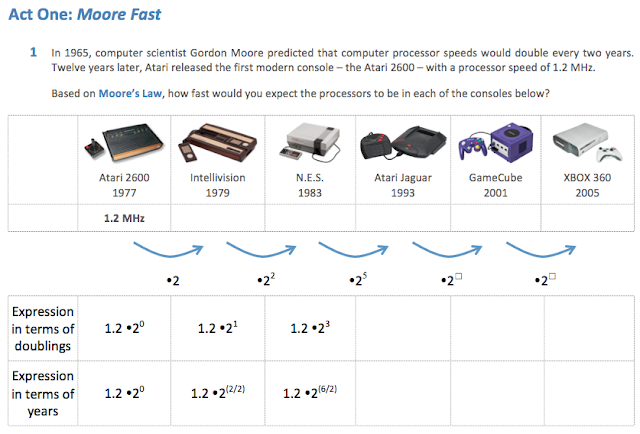 In it, we tell students about Moore's Law. 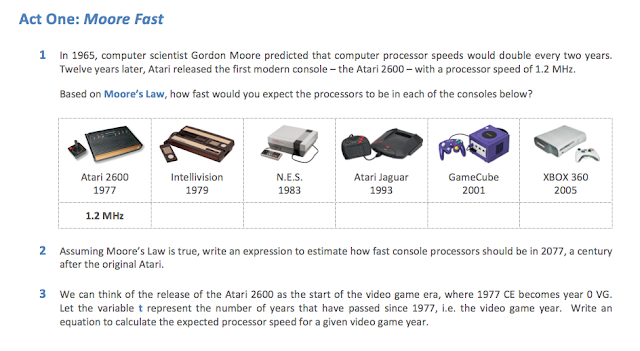 They use it to make predictions about how we would expect video game console processor speeds to increase over time. 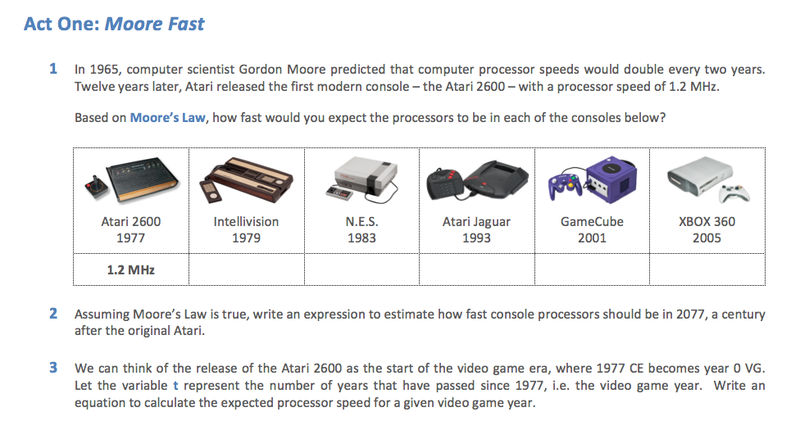 And then compare that prediction to how console processors have actually improved. It took nearly three hours. For four people. To write five questions. Let that sink in. Part of what is going on here, and the tension I want to think through here, is us trying to balance what is best for students' learning with what we can realistically expect of teachers. We want to give students the opportunity for as much inquiry as possible. But scaffold too little, and the lesson becomes too hard for too many teachers. Scaffold too much, and the lesson does too much of the cognitive work for the student, robbing them of the chance at the learning that comes from insight. Mathalicious lessons might feel very unscaffolded at first glance. But much thought goes into setting up students for success. We carefully choose given information. For example, since Moore's Law refers to "every two years" and the Atari came out in 1977, we found consoles released only in odd-numbered years. We chose two years later later than 1977, then four years after that, then ten years after that, to both gently ramp up the difficulty and implicitly suggest searching for shortcuts. We are also very deliberate about the wording of questions. For example, the third question could merely consist of the last sentence. We pay close attention to formatting, for example, since question one asks students to generate several numbers, that they will then use to look for and make use of structure, we organized them in a table. With the understanding that lots of teachers, at least at first, are going to be uncomfortable with our lessons. With the understanding that right now, it's maybe not for everybody. With the understanding that many teachers are going to have to get better, if they want the deep learning and the rich conversations and the joy that comes out of real learning and teaching. With the understanding that the part of the solution that we are offering - obsessively thought-out lessons, with engaging contexts and rigorous mathematics, that promote effective teaching and enduring learning - is not an easy or quick fix for a teacher who truly wants to improve her practice. We come to work and we have the same discussion. I hangout online with teacher friends and we have the same discussion. I go to conferences and we have the same discussion. The discussion is all about how do we help teachers be better. The "we" can be we at Mathalicious writing curricular materials, it can be we practicing teachers who want to help our colleagues or improve our own practice, we who believe the Common Core is a valuable framework, we teacher educators who work with pre-service teachers and reach out to inservice teachers. The discussion goes like this: We know what it takes for real learning to happen. There is tons of research to support it. We want students to explore rich problems, in contexts that are meaningful, be critical, make generalizations and abstractions, try things that don't work and try something else. We want teachers to give kids time to struggle, to help them gain comfort and perseverance in uncertainty, explore incorrect reasoning and channel it into better understanding, ask them better questions and give them fewer answers, and not rob them of the thrill of making insights. But, the discussion continues, this is going to take a huge shift. This is not the way we were taught. This makes many of us extremely uncomfortable. This is not what kids are used to. It can make them uncomfortable. It's also hamstrung by high-stakes skills testing that understandably makes teachers feel like they must employ direct instruction and lots of procedural practice. It can all be very frustrating if you let it. So what can be done? What can I do from where I'm at right now? If we consider all US math teachers as a population, some are further along than others. Some teachers are only comfortable with direct instruction of procedures. Some are comfortable with open-ended exploration, provided a high degree of structure and scaffolding. Some are comfortable with a minimum amount of structure. And there is at least one Shawn Cornally. While it's tempting to believe the distribution of US math teachers on this continuum looks balanced (red), it seems more likely the actual distribution is skewed (green.) Just so we're clear about my own level of hubris, I would put myself as a classroom teacher to the right of that maximum, but not too far. In writing lessons there are a million decisions to be made, and one of the biggest that guides all other decisions is, Who Am I Aiming At? There is a temptation to write ideal lessons for an ideal classroom - to aim way at the inquiry-based side of the tail. At those teachers you run across, online or in real life, that make you say "whoa." But there aren't that many of them, and they don't really need our help, besides. That lesson might look something like this. And, perhaps, we would not even provide a student handout. Realistically, we figure, our lessons are appropriate for a range of teachers. Those living at the arrow and to the right will value the quality of our materials and comfortably incorporate them into instruction. Those in the range, but to the left of the arrow, will find it challenging, at least at first, but we suspect that one important factor in excellent teaching is access to excellent curricular materials. Just like if you want to become a great novelist, part of your education is reading great stories. And if you want to become a great programmer, part of the process is understanding and using great code. I believe, due simply to my own experience using other people's stuff, that teaching a great lesson (even if someone else wrote it) helps a teacher learn what great teaching looks like. While Mathalicious lessons might be used mostly by the more risk-tolerant, skillful teachers in a building, we would love for their success to have enough gravity to pull their colleagues to the right. (Indeed, we are making plans for supporting them in doing just that. It's going to be so cool, you guys.) And that over time, that bubble will shift. Wow! You are doing exactly what I am trying to do (on a smaller scale) -I'll have to check you guys out. Thank you - it's great to find someone of like mind. I'm loving your work, and so are my students! I understand that it isn't always easy to make the transition away from traditional methods; both teachers and students have to step outside their comfort zones. It definitely takes more time to prepare for class (another reason I'm so grateful for Mathalicious). But the benefits are definitely worth it - students who think creatively, understand where the numbers really come from, and never ask, "When am I ever going to use this in real life?" These are the kind of conversations I would love to have with other teachers! Deep discussion around the questions/representations that get our students thinking... so cool.